If I could only use one word to describe our May guild meeting, it would be...colorful! Elizabeth presented our activity: "Your Color Story"
Elizabeth participated in a workshop led by designer Amy Butler at The Makerie retreat in Colorado. 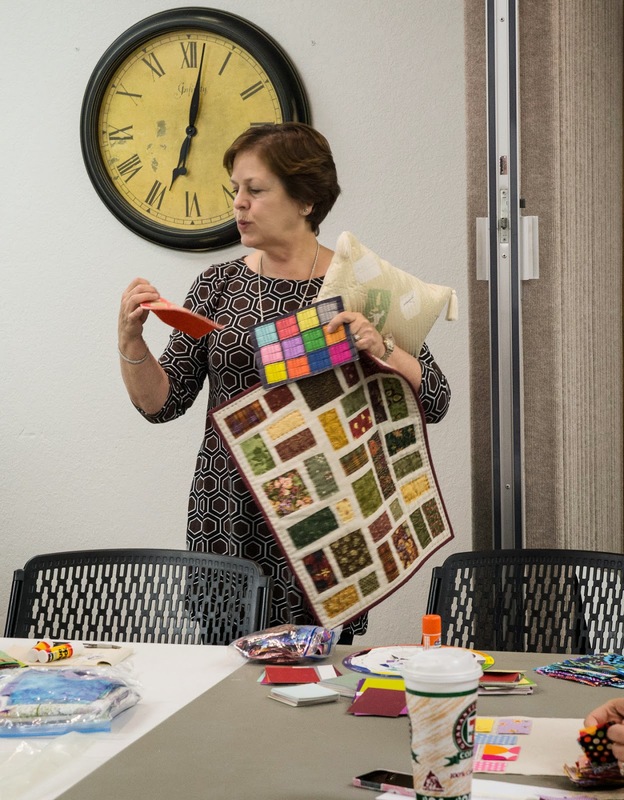 In the workshop, Amy shared how she achieved color inspiration for her fabric designs through her travels and photography. 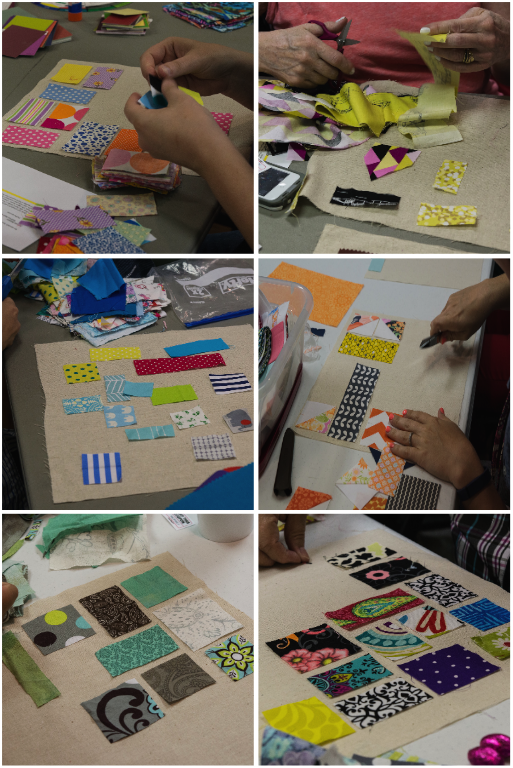 For our activity, we all brought our favorite fabrics scraps and then cut and glued them to another piece of fabric (then took them home to stitch them down). It was interesting to see what everyone brought. Some gravitate toward brights, other pastels or batiks. I love how you could often tell who-was-who just by looking at their fabrics. THANK YOU ELIZABETH for a fun activity! Many of us already knew that Ann doesn't like random. This cinched it. 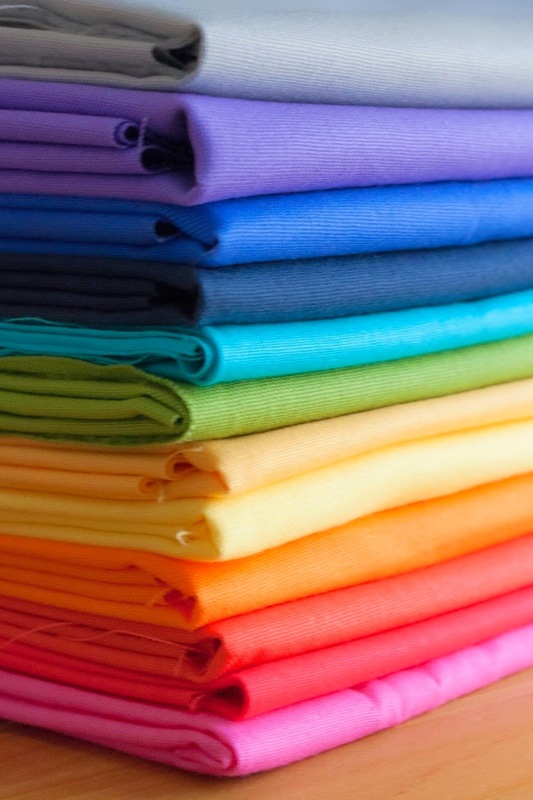 What does your color story say about you? 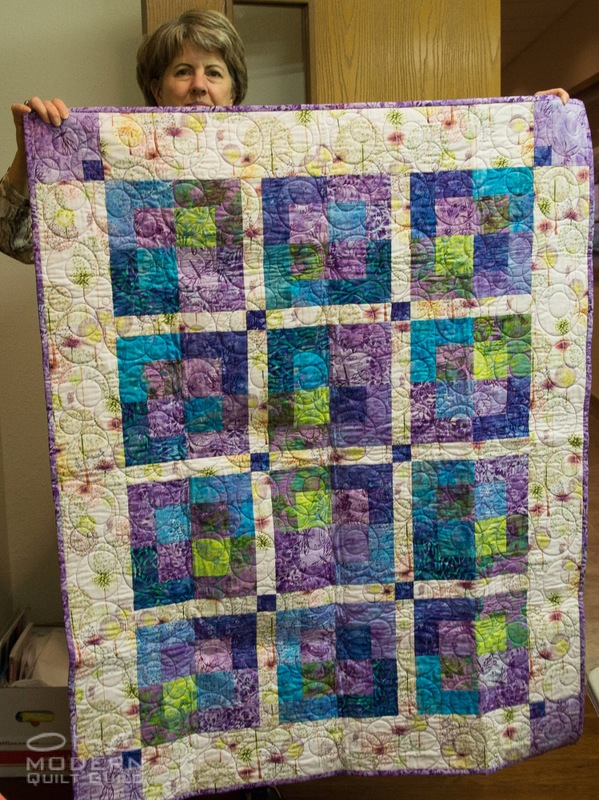 At our April Sew Day, a few members worked on this colorful, happy quilt that will be donated. 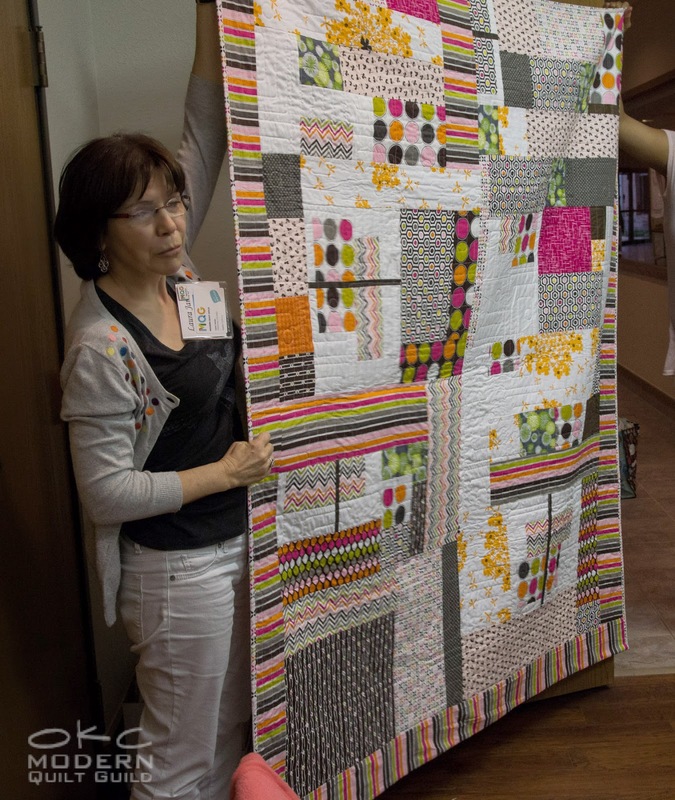 Most of the evening, Angie had this quilt on the floor for her daughter (whom she brought along) to lay on. 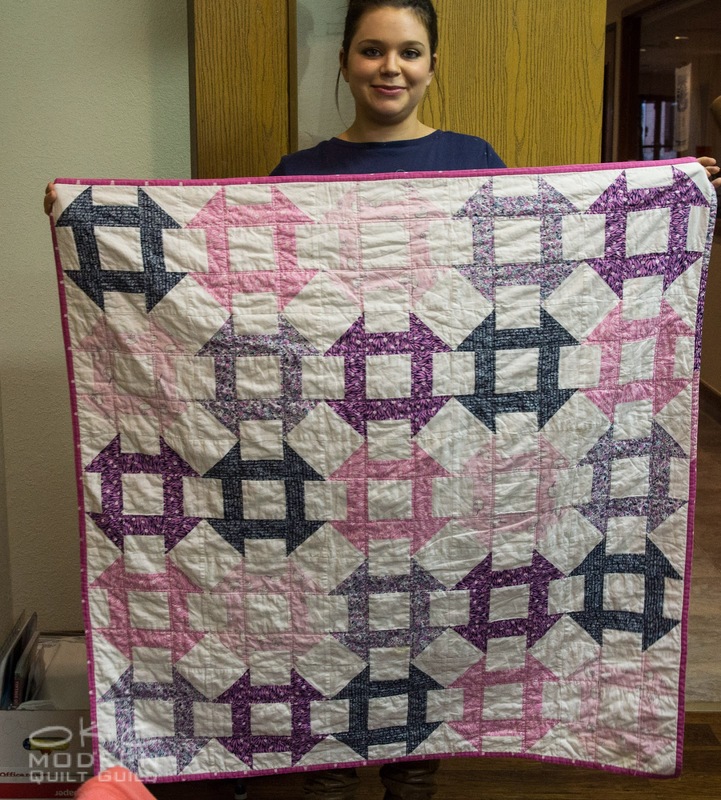 She said it was just a simple little quilt, and I heard someone behind me say, "It doesn't look simple to me!" Great job! Need a kid gift for a goodie bag? 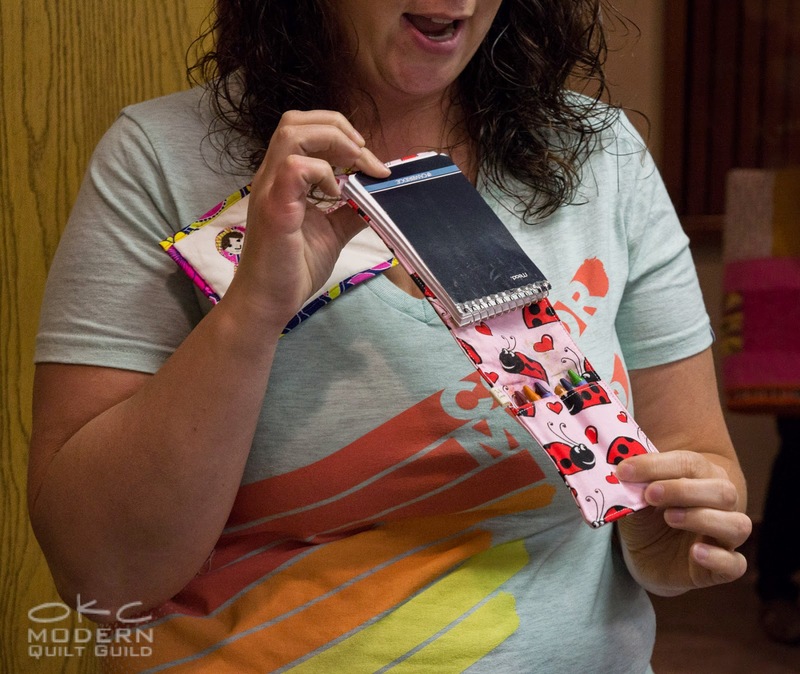 Audra made a bunch (like over 20) of these cute cases to carry a few crayons and a small notebook. How fun! 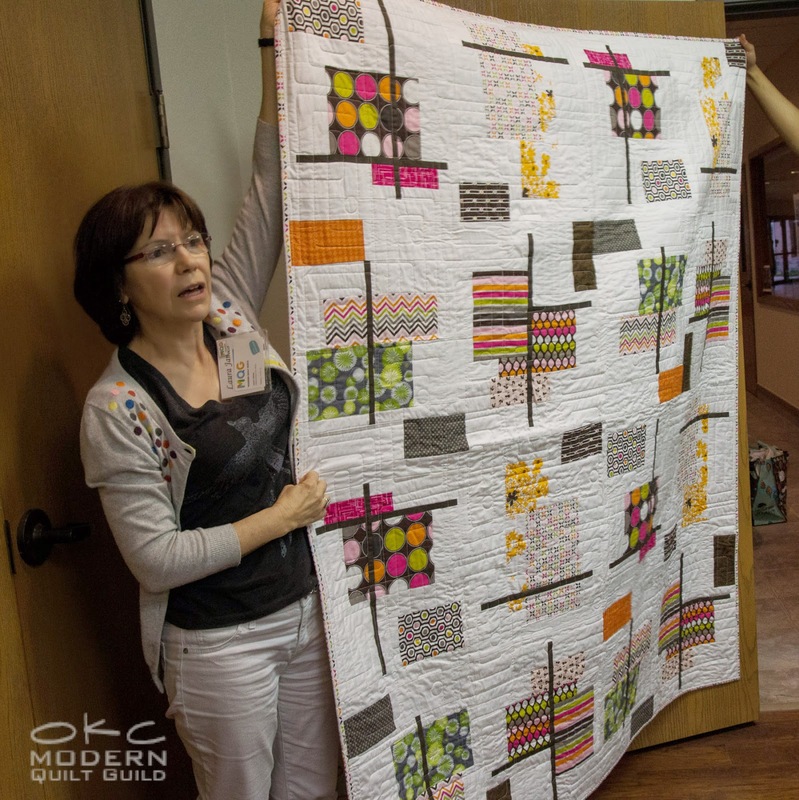 Laura made this wonderful "Avalon" quilt. A few of our members used this pattern in the past, so it's safe to say it's a favorite of ours. Laura loved the fabric so much that she pieced the back as well. I love this fabric too and this quilt! Beautiful work! 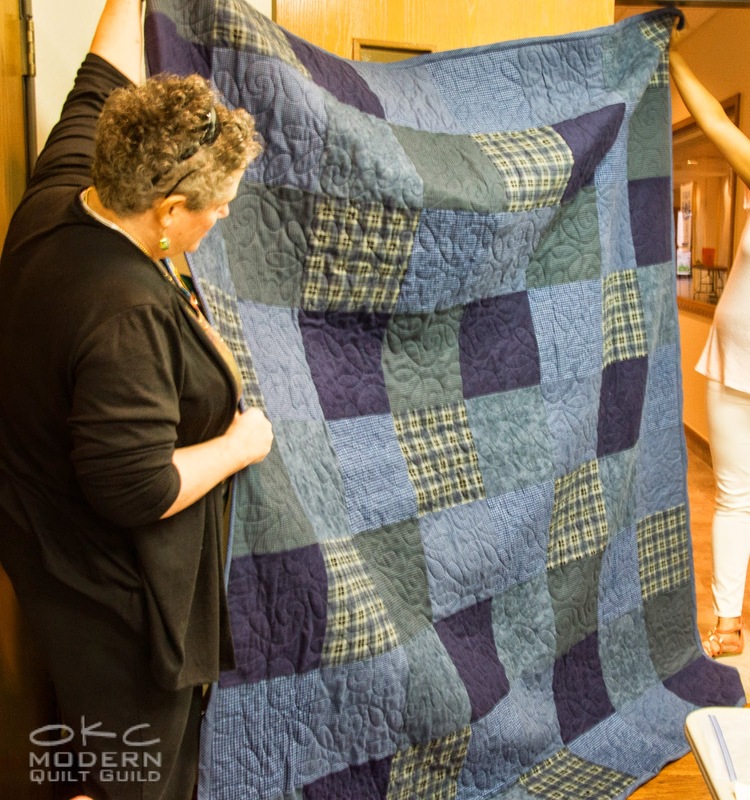 Cameron made huge (and heavy) flannel quilt as a gift. I always think it's so hard to make a good "manly" quilt. 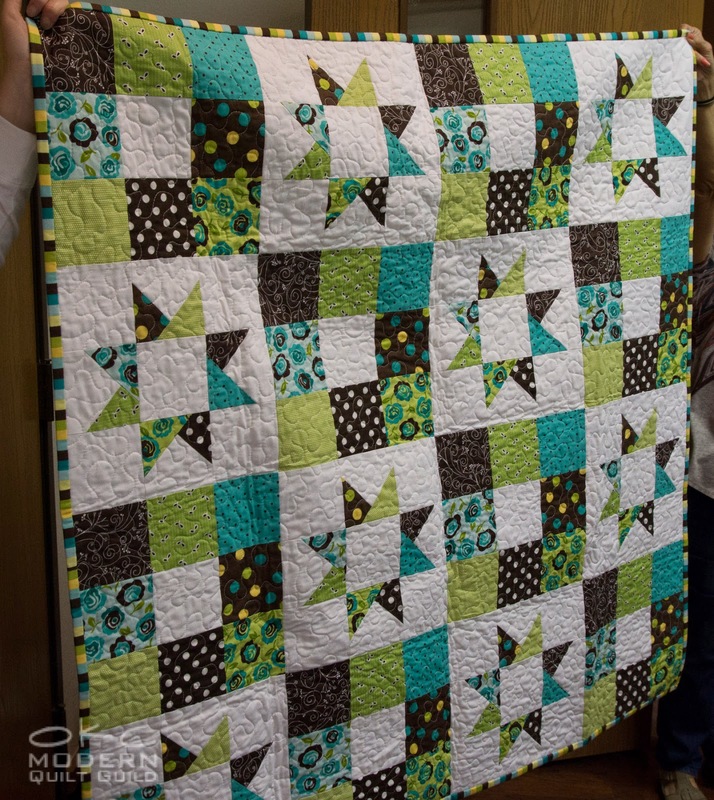 This one is great with terrific quilting! 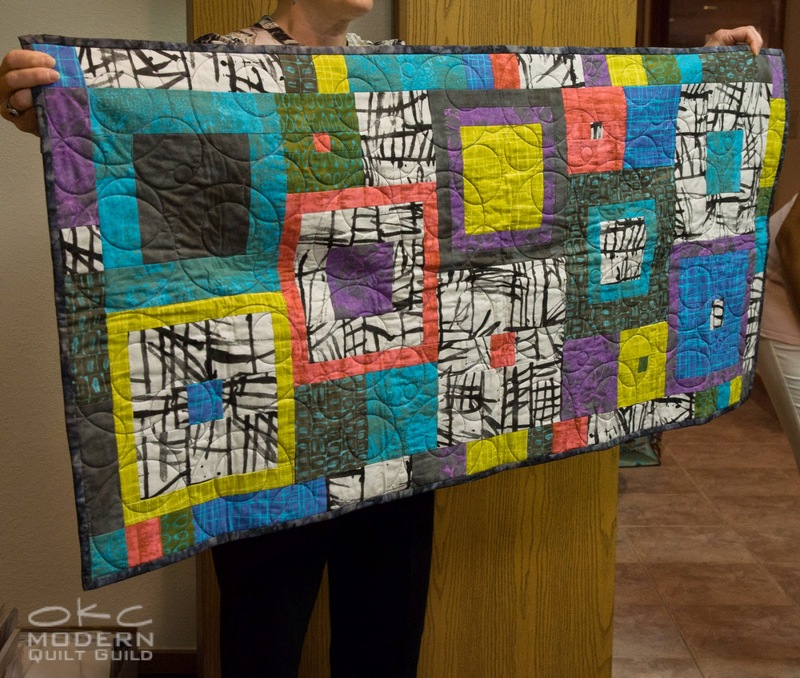 Ellen made this amazing runner and a friend quilted it. 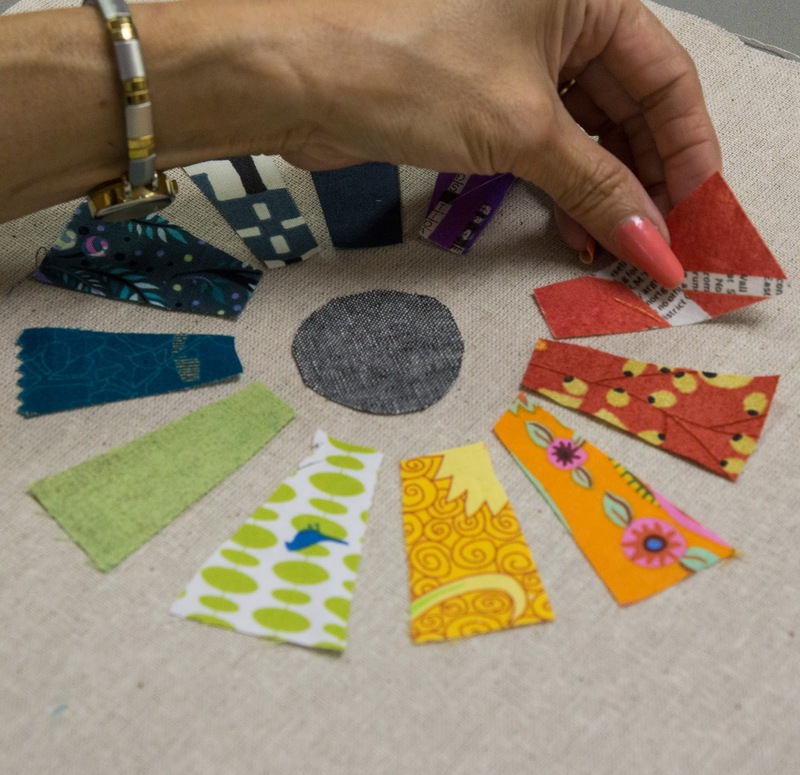 We were not only taken by the wonderful design, but also the unique fabrics of Marcia Derse. Ellen also made this sweet, modern baby quilt. We love those quilted circles again. Leslie made this quilt for a friend using scraps from the quilt she made for her friend's first baby and combined it with other fabrics from her stash. 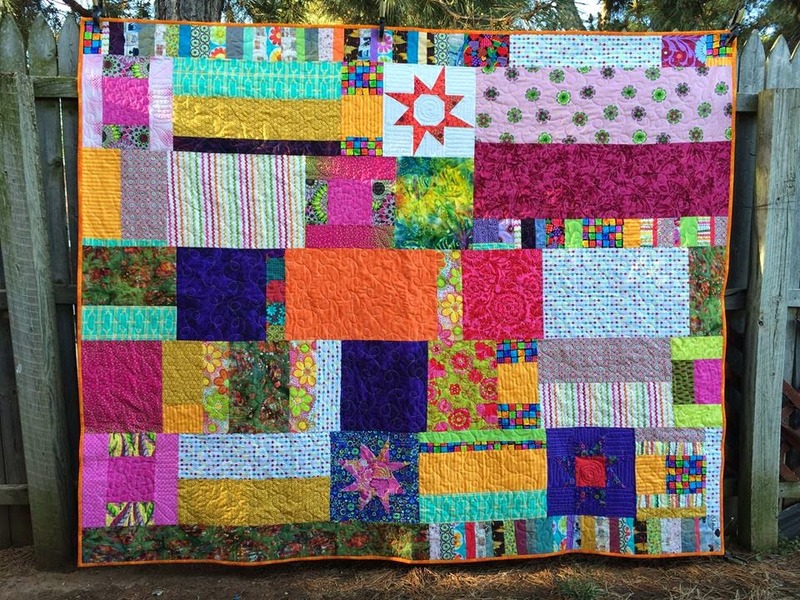 I think two sisters with coordinating quilts will be adorable! If you weren't able to join us at the meeting, you can catch up on everything here on the blog our through out monthly newsletter. Hope to see you at June's meeting!